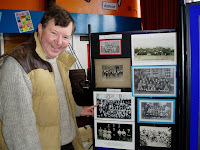 Dozens of villagers and former pupils came back to the village school in the middle of Ponteland for a nostalgic last look at a place which holds so many childhood memories and to see a display of photographs and memorabilia of the history and the changes in the school. Ponteland First School is moving out of premises, the original building of which opened in 1914, and moving up the road to a new site for the summer term. The staff and pupils are busy preparing to move into an ultra modern school on Thornhill Road. Ella Pears, who reaches her ninetieth birthday next month was a pupil in the 1920s when the school took children from the age of five till they left school at fourteen years old. She walked to school from Berwick Hill with her older sister and they brought sandwiches and a bottle of tea. The bottle was left on the hob in the master’s room. There wasn’t much in the way of traffic and the girls felt quite safe. The school was built at the request of the Poor Law Guardians of Newcastle upon Tyne to accommodate the older children from the Cottage Homes, located out of the village on the road to Kirkley. They had opened in 1903 to house deprived children from Newcastle as an alternative to the workhouse. The Guardians funded three quarters of the cost of the new school. The children from the Cottage Homes were known as ‘cottagers’ to the village children and can be identified on early photographs by the wide white collars worn by the boys and the white pinafores of the girls. Later the school became a Senior School, taking children from the Coates Endowed School situated on what is now the Green, and became known as the ‘Top School’. When the Cottage Homes closed in 1959 the school became a Junior School only. The last change was in 1972 when the County reorganised schools and it became a First School taking children up to the age of nine. There are many local families who have seen three generations pass through the school. Michael Taylor from Prestwick found his father’s name in the admission register as well as his own and then his children’s names. The Log Books, kept daily by the head teacher, recorded day to day events and often the weather when it was extreme. Snow storms featured and ‘school abandoned owing to a snowstorm’ seems most unlikely today. There were many health inspections and the school was often closed by the Medical Officer of Health if there were epidemics of infectious diseases. Most of those ailments have been consigned to history or are treatable now. Diptheria, scarlet fever, whooping cough, scabies, impetigo, measles, nits, were all regularly mentioned. The First World War passed unmentioned but the Second World War was more disruptive. When war was declared children and their teachers were evacuated from Wallsend and Cowgate to Ponteland with resulting chaos. There were air raids when the children went out into the back field and sheltered under the hedge before air raid shelters were built. The Head teacher, Lynn Blain, is very busy organising the move into the purpose built, modern building for the beginning of the summer term after Easter. The old school will be knocked down and the land sold off by the County Council to fund the new building and the heart of Ponteland will change again.